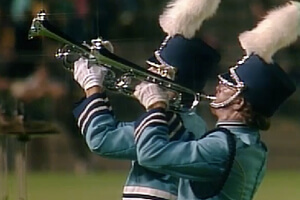 In 1984, Spirit of Atlanta was still very much regarded as DCI's "Southern Corps." The group performed several seasons of music reflecting the corps' heritage, but even when the corps wasn't playing Southern-tinged music, the general attitude conveyed was very much down home and sultry. Spirit's sixth place 1984 show was largely based on George Gershwin's popular folk opera, "Porgy and Bess." The work was premiered in Boston in 1935 and enjoyed a successful run on Broadway and on the road, but it took decades for American opera companies to accept it as a legitimate opera. The New York Metropolitan Opera didn't present it until 1985, the year after Spirit of Atlanta put it on the field. The grandiose opening of "Bess, You Is My Woman" wasted no time in introducing the pairing of the male and female color guard members, a theme that would build throughout the show. "There's a Boat Dat's Leavin' Soon for New York" demonstrated the corps' jazz roots. That segued into the soulful "It Ain't Necessarily So" before returning to a Broadway-ized "There's a Boat…" to wrap up the opener. A squealing soprano bugle seemed to be holding on well past the cut-off, but it was simply introducing the pop standard, "Blues in the Night" (written for the 1941 movie of the same name), a definitive Spirit of Atlanta production. Growling and sweltering, the piece was very much in the character of what one had come to expect from the corps in previous years. Performance excerpt of the 1984 Spirit of Atlanta. Not so much expected was the drum feature "No One Together," by the rock band Kansas. The brass section wailed as the entire work headed back into a recap of "Blues in the Night." Somehow, jumping back and forth between decades within a single piece worked. "I Loves You, Porgy" and "Bess, You Is My Woman Now" from the folk opera was accompanied by a rack of 21 hand bells that sat in the modestly sized front ensemble. Just prior to the final push, the guard appeared to carry a banner over 40 yards long that was actually made up of individual flags. The corps ended with a very brief closing statement of "It Ain't Necessarily So." Though there were other Spirit of Atlanta shows that capitalized on the corps' Southern roots, this show may be the most Southern of them all. This week only, you can save on 1984 World Championship Audio and Video Performance Downloads on the DCI Fan Network. Buy the 1984 Spirit of Atlanta Video Performance Download. (Available this week only for $3.99. Regular price: $4.99.) Buy the Audio Performance Download bundle of all 12 Finalists from 1984. (Available this week only for $15.99. Regular price: $19.99.) Offer ends Monday, May 30 at 8:30 a.m. ET.